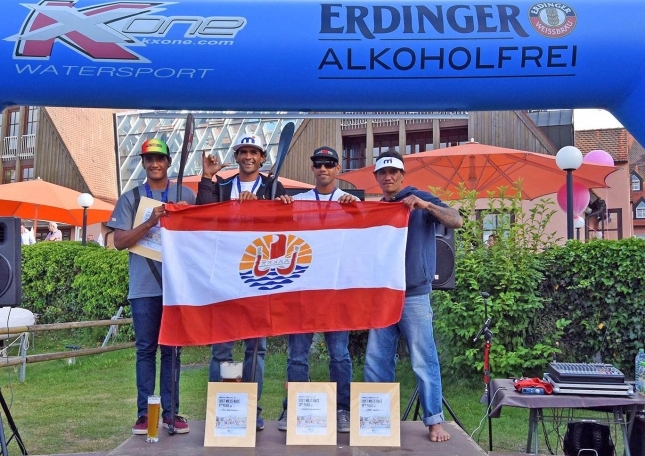 In brief: As if we needed any more of a reminder that Tahiti’s powerful paddling warriors are on the verge of dominating long distance SUP racing in the same way they’ve done for years in the outrigger world, just take a look at the Lost Mills results from the weekend where Tahiti claimed all four top spots courtesy of Steeve Teihotaata, Georges Cronsteadt, Enzo Bennett and Bruno Tauhiro. Going a couple of spots better than they did in Carolina, where Georges was 3rd and Steeve finished 4th, Tahiti’s star duo were clearly too strong for everyone else in the field except for fellow Tahitian Enzo Bennett, better known as a sprinter but clearly someone who has some endurance potential after he hung onto the lead pack right to the line. Georges and Steeve are national heroes back home in Tahiti, where first the former and then the latter domianted the world of “va’a” (Tahitian outrigger) canoe racing. They were joined in Tahiti by another legendary figure in Bruno Tauhiro, who led home the chase pack to make it a clean sweep of the top four for the Polynesians. And keep in mind Tahiti was missing one of their other top paddlers in Rete Ebb, while there’s probably another two or three dozen paddlers back home that could have fought for the top 5 and top 10 spots. While the Lost Mills lost a lot of its luster this year – the 6th annual ‘Battle of Bavaria’ was downgraded to a regional event with a 2-star rating after many of the internationals elected to do the EuroTour race in San Sebastian instead (the Lost Mills has always been the biggest race outside of the USA but clearly suffered from the odd decision to opt out of this year’s European summer tour) – it was still a mighty impressive effort from Team Tahiti, who controlled the men’s race from start to finish to dominate the field of German dark horses and regional stars. In the women’s, Sonni defended her title and was joined on the podium by Mistral duo Lena Ribeiro from Brazil and Petronella van Malsen from the Netherlands. Sonni’s big victory in the women’s distance race – she was almost 10 minutes clear of the field in the windy conditions – continues the German’s strong summer campaign where she’s been virtually untouchable. This run of good form puts Sonni in a great position in her quest for a fourth straight Molokai-2-Oahu title next month. Finally, a new young name to watch is Christian Andersen (aka ‘Polar Bear’) from Denmark, who’s perhaps looking to follow in the footsteps of his famous compatriot Casper Steinfath after claiming a top 10 finish on the weekend–Christian will represent the host country at the ISA Worlds in September. Full results from the weekend are below. More coverage on the official Lost Mills Facebook.